INSEAD and Northwestern alumni are invited to an evening conference in Basel to hear about the startup experience in financial markets. Join us for an event that features a case study and the experiences of Vaibhav Kadikar, MBA’11J, CEO of Close Cross, the venture capital-backed Fintech startup developing a blockchain based peer-to-peer derivatives trading platform. The number of places is limited, so we suggest you book now! Vaibhav Kadikar, CEO Close Cross Ltd.
Vaibhav is a senior executive, entrepreneur, innovator, convergence theorist, digitalization and Blockchain leader. 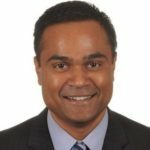 Prior to his current role, Vaibhav held business and corporate development positions at Syngenta, Oerlikon, and Unisys. In 2011, he created and patented an algorithm used to capture the “Knowledge Value of Time” in financial trading (USPTO 2011).